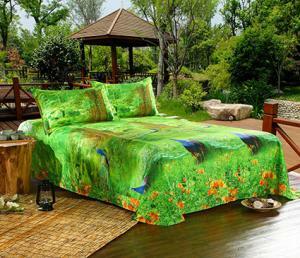 There are many ways you can take advantage of the majestic peacock and its vibrant green and blue colors. You can use actual art representations and carry the theme throughout your home with colorful patterns. Select the main color scheme for your home decor by using the brilliant plumage and body of the peacock. These colors range from emerald green to pale lime and deep royal blue to turquoise. In using the peacock color scheme, it's best to first decide on the main color you wish to use in your design. Will you go with the royal blue or aqua hue? Perhaps you prefer one of the many values of green instead of the blue. Select one color from the ranges of hues for your main color and then add two others to complete your color scheme. To get an idea how you can use the peacock colors for selecting a color scheme, put together three colors with one being the main color. The easiest way to use a peacock theme for your home décor is to first select the design style start with the main living area. Once you have your style selected, you'll want to find appropriate fabrics for window treatments and furniture, rugs, and other furnishings. 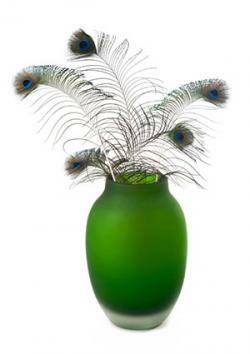 A floor vase in one or several peacock colors filled with peacock feather plumes can grace a foyer or on a fireplace hearth. 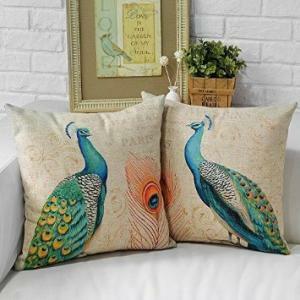 Peacock silk-screened throw pillows are great to use on a couch or lumbar pillows for dining room chairs. Pair of paintings of peacocks can be used with one over each nightstand. A peacock sculpture in white can be used as a great modern accent piece on a coffee table or sideboard. An abstract painting of a peacock can be placed over a fireplace mantel. Hand-blown glass peacocks can be set on a bookcase or shelf. Wall art of a painted peacock on weathered boards makes a great peacock-themed decoration for a den or kitchen. A decorative peacock bowl and be placed on a dining table or used on a country style sideboard. A brass patina peacock figurine can be a nice addition to a rustic-country décor. Mix up your design with the unexpected addition of a Tiffany stained glass wall light sconce. Peacock table lamps can accentuate a living room, office, or bedroom. 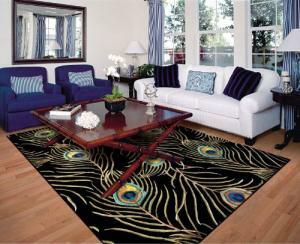 A striking contemporary stylized area rug featuring the iconic peacock sets the stage for a great room design. You can combine your color scheme and design style to create a foundation for the peacock theme. Add a few specific motifs to your rooms to carry out the theme. Be sure not to go overboard and sabotage your design with too much of a good thing. 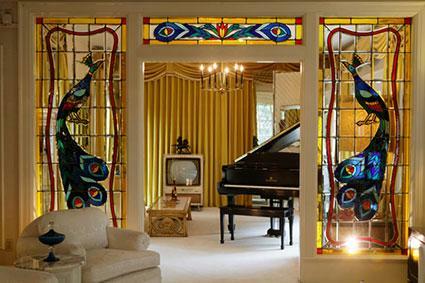 Depending on the size of your room and depth of your room design, you may use three or five peacock representations. The key to successfully adding these to your décor is to vary size and place throughout the room. These and other decorative objects you use in a room design should create interest by attracting attention from first entering the room to drawing the eye into the room. This layer effect is vital to creating a balanced and well-thought out design. The first area inside your home is where you'll want to begin adding peacock motif items - the foyer. A peacock table lamp is ideal when placed on a sideboard or console table in the foyer entrance. Set a porcelain umbrella stand featuring a peacock by the door, sideboard, or staircase. Add a double sconce with a peacock motif design on the wall opposite the front door to carry the theme farther into your home. This room can be offers many opportunities to layer your theme. Place a peacock stylized area rug in the room being careful not to obscure the peacock design. Set a signature sofa in your main color or a striking white accent and add three peacock motif throw pillows. Place a series of six framed artwork in the colors you selected for your color scheme on the wall behind the sofa. 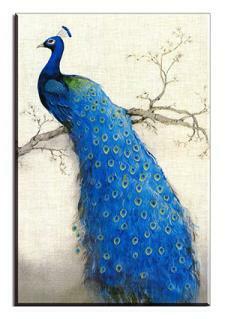 Hang a pair of peacock wall art above a fireplace mantel or on the wall across from the sofa. Place a floor vase filled with peacock feathers in the corner across from the room entrance. The dining room is an ideal room for multiple uses of the peacock motif. Play up your color scheme with draperies, tablecloth, linen napkins, area rug and dining chair upholstery. 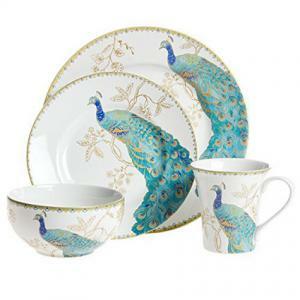 A stunning way to use a peacock motif is with a peacock china pattern. Add a Tiffany style stained glass floor lamp in a corner. On the buffet, place a peacock bowl filled with decorative ceramic balls. If going for a dramatic look, choose a peacock upholstery design for dining chairs. If you desire more peacock motifs, add others with varying textures, such as ceramic, brass, or distressed shabby chic. You don't have to overlook your peacock design for the kitchen. You can add various motifs in this room, too. Carry out your color scheme in this room as well. Using white peacock motifs is a great way to break up your theme with an accent color. Peacock refrigerator magnets are a simple choice. Breakfast room draperies in a peacock feather pattern add a flair to this area. Place a wall clock or metal wall art breakfast room in either the kitchen or breakfast nook. 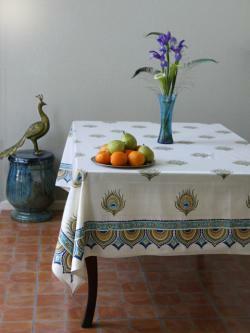 A white linen tablecloth with a peacock design completes this area. Making smaller design statements in a bathroom with your peacock motif is easy. Decorative peacock soaps in a simple bowl or soap dish fills the bill for continuing your design motif. Decorative hand towels with embroidered peacock designs can also be used. 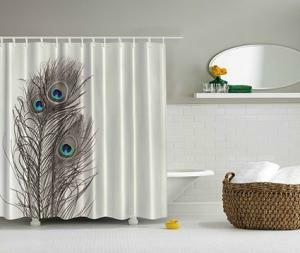 If you prefer bold, a colorful peacock shower curtain can be used or a more subtle style with a peacock feather border or pattern. Decorate the master and guest bedroom using this design theme and color scheme. How much you opt to use of the motif is a personal choice, but as with most design motifs, less is always more. Draperies in a solid, stripe, or other pattern continue the peacock style. You may choose a peacock pattern comforter and matching shams. A comfortable chair in your main color choice can share the theme with a peacock throw pillow and/or throw. Smaller objects of varied styles can be used on a nightstand, dresser, or side table. Framed artwork on the wall in a reading corner with a pair of chairs, table and a lamp creates the perfect vignette. For a retro look, use a wicker peacock chair with a cushion and peacock pillow for a tropical or Plantation design style. Children can get in on the fun with wall decals, furniture stencils, and other fun furnishings such as lamps, draperies, and comforters with a more child-like design. These are just a few of the many ways you can decorate your home using a peacock theme. You can confine this design style to just one room or use it throughout your home.